AllJ Slots is a great tool to use to manage prize giveaways at your table or booth at your trade show. Setting the slot machine reels to include images of your prizes, products and services, and even your corporate logos, provides a level of branding you won't find elsewhere. 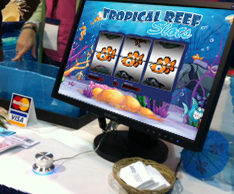 Run AllJ Slots on a laptop or PC and display the game play on a high profile wide screen to get lots of attention at your next Trade Show! Customize the spinning reels with images of your prizes, your company logos, products & services, etc. Apply your branding, and customize the audio to generate the perfect level of excitement that's sure to get attention! 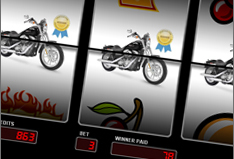 You can also set a limit on any of the prizes that will be awarded, and AllJ Slots manages it for you. For example, if you have 1 Grand Prize and 20 Tshirts, you will be able to set the maximum number of times a particular Prize (pay-line) will hit. Once that limit has been reached, the game will simply avoid that pay-line. This allows you to give away exactly the number of prizes you have to award. The Griffin's USB Button (shown on left) allows you to simplify the play experience with a "press to play" approach. 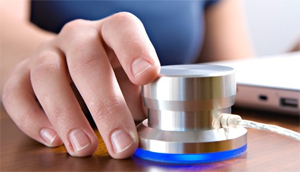 The button is Plug-n-Play, costs around $40-$50, and can be purchased at http://www.griffintechnology.com. This seems to be the most popular approach at trade shows and vendor fairs. AllJ Slots is also compatible with popular wireless powerpoint controllers, giving you the ability to take advantage of some of the hidden response features supported by the software. 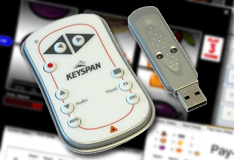 A Wireless Powerpoint Controller will allow you to take advantage of PLAY/PAUSE/RESET functions, as well as a secret JACKPOT TRIGGER option supported by AllJ Slots. These controllers cost around $35-$250, and can be purchased at http://www.tripplite.com. Be sure to select a model that supports the ESC and F5 functions (the PR-EZ1 works nicely). AllJ Slots is a very effective tool for drawing attention and managing prize giveaways at your table or booth. The prize giveaways, exciting audio events and realistic visuals, all add a level of life & excitement that's sure to get lots of attention. Download the trial version HERE and try it out.